Primarily Southern NJ (Atlantic, Burlington, Camden, Cape May, Cumberland, Gloucester and Salem Counties). I will travel to Northern NJ, Pennsylvania and Delaware. I work on a reward basis, that means you pay what you feel its worth for me to come out and find your lost item...You only pay if I find it unless you would like to cover my fuel costs. I am married and have 2 grown children. I have been metal detecting since 1992. I have returned numerous items to distressed citizens. I love helping people, that is why I became a Flight Paramedic. We were featured in SJ Magazine, September 2016 issue about my hobby of returning lost items. From the bottom of my heart I want to thank you for finding my lost 1980 NFL Conference Championship ring with your metal detector. I was reasonably sure I lost the ring while doing spring clean-up in the yard. The day I called you in desperation for help, you came over immediately to try and find the ring. Although the weather was miserably cold and pouring rain, you nonetheless scanned the yard for hours trying to find it. I was obviously disappointed when you could not find it, however you said you would like to return in warmer weather to try again. I was not absolutely sure I lost the ring in the yard, and for weeks looked everywhere but unfortunately it did not turn up. 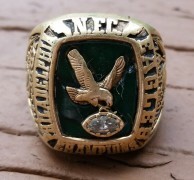 By summertime I had completely given up hope and contacted the NFL League office to inquire about replacing it (custom molds for all Super Bowl rings are kept on file). Then out of the blue in August you called me again, offering (at no fee) to come back for another search. On your second search, to my unbelievable surprise, YOU FOUND THE RING! under a landscaping bush. I was so thrilled when you told me, I actually broke down and cried with emotion/thankfulness. I cannot thank you enough for your dedication, honesty, integrity and persistence, and whole heartedly recommend anyone contact you for help locating lost items. You are truly and Angel of God! Just another Saturday at the beach or so we thought! As a mother of 3 young boys, I decided to take a last minute day trip for the end of summer. We piled up the minivan with my husband, my mother, our AuPair and my three boys! Before leaving the house…my inner voice told me to leave my wedding ring at home since I had lost some weight…it was loose but, I didn’t listen. We packed the car full. We had the cooler, beach chairs, boogie boards and toys for the sand. We brought everything but Sunblock…. Yes, we all ended up burnt. We drove around for about 15 minutes trying to find a parking spot when we came upon Cove Beach in Cape May, NJ. I’ve been going to Cape May beaches for over 20 years and have never been to that particular beach before. So, we parked the car, and set up our stuff. We played in the water! Taking on the waves. My two oldest boys were brazen…going out really far….enough to concern the lifeguards to whistle us in closer (it was a yellow flag day)….so then we built sand castles. We then came back to the beach blanket and ate some snacks. Back to the water again, riding the waves and then the youngest wanted to come back in the sand castle area. I had some trouble getting up out of the water and put my hands in the sand and there went the wedding band. But, I didn’t notice it then…I went back into the water with my husband while the kids searched for the perfect shells! When I came back…I sat down in the sand where the waves crashed in on our legs digging my hands into the sand looking for shells for the boys…we posed for a few family shots and then I realized it! The ring was gone. OMG! I turned to my husband and lifted my hand to show no wedding band! He said “You’re joking, right?” “I wouldn’t joke about this” I said. He immediately jumped up and helped me frantically searched the sand. The tide was coming in harder and harder…we could hardly see. The kids looked, the babysitter looked, even some strangers on the beach…I was crying so hard, I needed to clean my glasses….I then realized from the family pictures…I might be able to see when I last had it on… and I saw it!!! When I was swimming with my youngest son. So, I knew where it was probably gone at but the tide had come in so far I knew I’d never get it back. I cried and cried. My husband hugged me and said he’d buy me another one. It wouldn’t be the same. I didn’t want a new wedding band…I wanted the one he gave me when we promised each other the rest of our lives together 10 years ago. I thought it was ironic that my husband asked me to marry him and gave me an engagement ring on another beach in Cape May, NJ years ago and now I lost my wedding band in Cape May, NJ. A short time later, I was so upset and defeated…we packed the car back up and headed home. After the beach, we were supposed to go to the Wildwood boardwalk and ride some rides but….I just couldn’t build myself up to enjoy it. On the ride home I knew I’d never get my ring back. My mom reminded me that other than my ring loss, I still had my family and my kids were safe and happy. Even though my family was safe and that was really the most important thing to me…I still couldn’t stop being upset about losing my ring and my stupidity for not leaving it at home. My mom offered to come back the next morning and comb the beach with me… When I got home and everyone was getting ready for bed…I Googled to see what my chances would be if I could even had any chance. 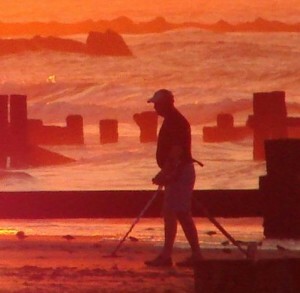 I looked at the possibilities of renting a metal detector and then came upon TheRingFinders.com. 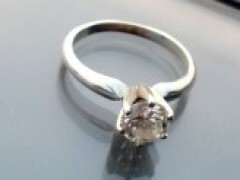 I read of success stories of rings found and my hope was restored. I found Dave Milsted and called him to see what could be done. I told him it was a gold wedding band with 11 inset diamonds. He told me to map the area I thought it was lost. I immediately mapped where we were sitting, where I thought it was lost and where we swam. Then my 3 boys brought me beautifully made “homemade rings” made from paper to replace my wedding band. I smiled for their thoughtfulness and creativity. I then sent the email to Dave. I didn’t hear anything back. I anxiously checked email in the morning and saw I mis-typed his email address. OMG!!! Quickly I resent it to the correct email and added some more details. Dave responded immediately and suggested he could go out on Tuesday. Slightly disappointed I put my faith in the fact that he has been doing this for years and if he felt there was an urgency…or not…then he’d be right. So, I stopped worrying until Tuesday. Since 8am Tuesday morning, I checked my email and phone every 30 mins or less. As the day pressed on, so my pressure skyrocketed. I even shed a few tears while telling the story to co workers. I figured, the longer it took to hear from Dave, the less likely it would be that he’d found it…. Then, I received an email from Dave saying he had a few questions asking me to call him! I jumped right on the phone and called. Dave asked me a few more questions about the location I thought it was lost. I explained where I thought I was and then he told me that the beach was packed and that there were already folks with metal detectors, the sand was loose and….my heart sank. Then, he then told me he found my ring! I think I asked him if he was serious….and after he said “YES”…I was speechless. I couldn’t speak…I was crying hysterically and couldn’t stop! The sentimental value for me was so much more than the jewelry price value. I tried to get out the words to say Thank you and that I would call him back when I left my job to discuss picking it up. I immediately called my husband and my mom crying. They could hardly understand me but they finally realized what I had said and were both shocked and excited! Dave, there are no words for what you do for people/families like ours. There is no replacing a memory or the value that was placed on something because of its emotional association with it when something is lost. You replaced it for me and renewed my strength in humanity that there are honest people who care about others and want to help people…”Thank you.” That is the smallest thing I can say and the biggest thing I can mean at the same time. I am glad my wedding band will be in safe hands until we officially meet and I promise to NEVER wear it in the Ocean again (at least until I get it re-sized)!!! On Friday August ninth my evening began like so many others and ended like no other…My fiancée and I went to dinner and we were having a wonderful evening; great food, music and drinks. We were discussing what day we should plan our wedding, where the location would be etc. Later we left the restaurant and the idea of taking a walk on the beach to watch a lighting storm over the ocean seemed romantic and appealing. Once there, we walked hand and hand…the sound of the ocean and waves lapping up onto the shore was just so beautiful…so beautiful I decided I was going to go wading around in it. It was now dusk, and looking back, it wasn’t the brightest idea in the world because when I turned to look at my fiancée one of those very waves hit the back of my knees which caused me to loose my footing and down I went into the surf…I struggled to get myself up but it proved so difficult Daniel had to trudge in and come to my rescue. Soaking wet and humiliated I made my way back to the car, dried off, changed into some clothes, and headed home…that’s when Daniel said “Babe…your ring!” I looked down to fine only a tan line where my ring once sat. It was gone…washed away in the tide when I struggled so foolishly to gain ground. I was instantly heartbroken and quite honestly, hysterical. I didn’t know what to do. The next morning I woke at dawn and raced to what I thought was the location, and began searching. Up and down the beach I walked straining my eyes in hopes to find this ring that meant so much to me, defeated I left only to return in the evening with a three pronged rake…I dug, and looked and cried, still there was no ring. It had seemed the ocean had taken it for her own and the sadness and guilt I felt only deepened. Later that night I was on the computer…my ring of course being the only thing I could think about; I began searching lost rings in the ocean. As I scrolled through a sea of tales written about similar experiences I stumbled onto a site TheRingFinders.com, my curiosity was peaked. Clicking through the links I finally came across the name Dave Milsted and I thought to myself “It’s worth a shot to shoot him an e-mail…what’s the worst that could happen, he won’t answer”? Before I knew it I was writing to explain my desperate situation and asking for help. I clicked send and I waited. No sooner did I write I saw there was a reply…and it was Dave! I nearly jumped out of my chair I was so excited, I actually got a response and he was interested in coming to my aid…I had a shred of hope, finally. After a brief correspondence Dave said he would be willing to search out my ring and that he could come that Monday…the longest two days of my life I must say, but I was overjoyed that there was a chance that maybe, just maybe, I would find this diamond in the sand. Monday finally came and Daniel and I met up with Dave at the beach entrance in Brigantine. I was a bit nervous due to the fact that the sky was beginning to look a bit ominous. The dark clouds stretched out over the dunes and we moved fast in an effort to cover what ground we could. Daniel pointed out where he roughly thought I went in and as I stood at the waters edge I thought “I think I was here” a bit south from where Daniel had suggested but he insisted, and I was unsure so I went and agonizingly looked on as Dave began his search. Tirelessly he moved back and forth through the water and along the beach scouring the sand with his new detector (I later found out I was the first to break this one in); it began to rain and I looked at the sky silently pleading for it to stop so Dave wouldn’t…he didn’t; instead he only continued. Finally, the rain eased up and a rainbow broke out in the horizon just over head of where Dave was working. Daniel said “Look a rainbow” I smiled a little and hoped it was a sign but one hour, two hours, three hours passed and still no ring. It wasn’t here I thought. At this point my Rainbow man was now working in front of me in the tide; I told Daniel I was going to ask him if he would come back Saturday to work the South side where he was now inching towards, I just had this burning feeling it was there. Daniel was insistent that it wasn’t down that far but I said “It will make me feel better if I know this whole area was covered.” No sooner did I say it I saw Dave approaching and I slowly got myself up to meet him. As I moved closer to him I began to speak but before I could say a word he shook his sifter at me; I looked down and there it was, my ring!!! Dave pulled it from the ocean, and truly blew my mind! I was stunned, ecstatic and absolutely over the moon! Daniel couldn’t believe it. I must have hugged Dave ten times in that moment! August 9th was one of the worst days of my life, however, August 12th became the day I will most remember and I have no one else but Dave to thank for that. He returned something precious to me…something I thought I would never see again. I’ll forever be thankful to you Dave. You are an angel…not just to me, but to so many others and you will forever be… my Rainbow Man. Thank you! 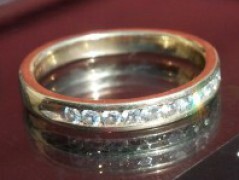 I can’t thank you enough for finding one of my most valuable possessions, my wedding ring. I lost it because I let my vanity get the best of me- I took it off while getting some sun and soon thereafter dropped it in the grass. I didn’t notice that it wasn’t on my finger until hours later but by then it was too late. Neither me, my husband nor 3 other friends could find it after hours of searching. We even borrowed a family member’s “really good” metal detector but soon learned that not all metal detectors are made equal. Lucky for me, after searching online for metal detectors, I found your advertisement online under “Ring Finders.” I had no idea someone like you was out there but can attest, your job is highly valued as you found my ring within a couple of minutes. Unbelievable! My husband and I are forever grateful.